Applied Material: lime stone, medium-hardness iron ore, feldspar, etc. 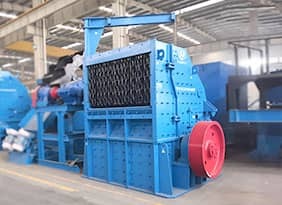 1.“V” type of crushing chamber, effective opening size is equal to the nominal opening size (common jaw crusher adopts the traditional asymmetric crushing chamber structure, and effective opening size is smaller than nominal opening size)and the throughput capacity will be increased by15-20% compared with the normal crushing chamber. 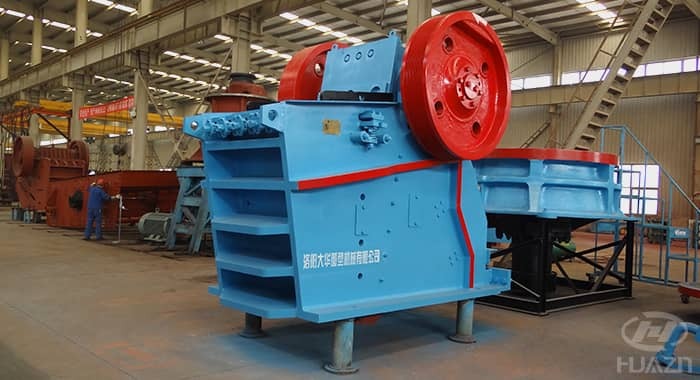 2.The discharge opening applies the hydraulic adjusting unit, the optimized chamber and motion parameter make the product have greater through capacity for same clearance. 3.Smaller discharge clearance for same through capacity. 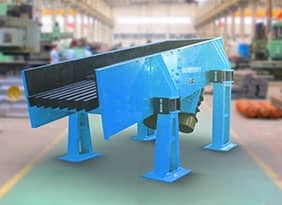 The main components of frame adopt high- quality manganese steel, thickening steel plate, and finite element analysis method is used to evaluate mechanical strength in the process of design to improve the load resistance and impact during using. Cold installation process for bearing and thin oil lubrication make service life prolonged and efficiency of the rotation improved. 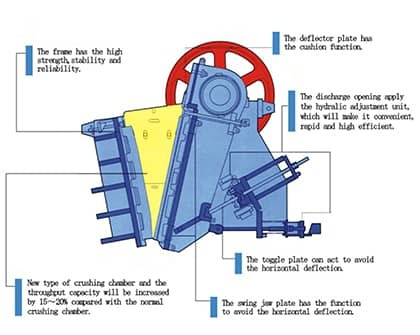 The electric motor drives V-belt to make the swing jaw up and down through eccentric shaft. When the swing jaw goes up, the angle between toggle plate and swing jaw gets bigger, and the materials can be crushed. 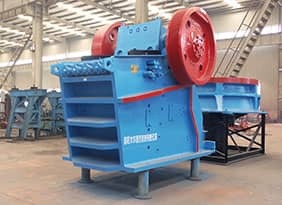 When the swing jaw goes down, the angle between toggle plate and swing jaw becomes smaller, the swing jaw moves away from the fixed jaw plate, and then the crushed materials will be discharged from the lower outlet of the crushing chamber. 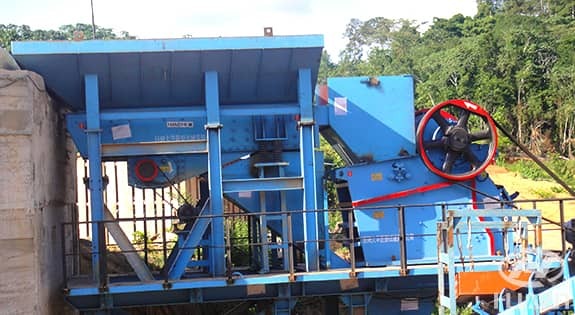 It is designed for granite crushing in Cameroon. 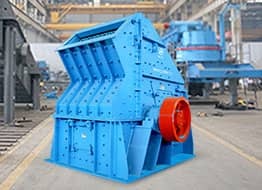 The production capacity is 100-150t/h. The main equipment: ZSW vibrating feeder, ASJ-E jaw crusher, GPY cone crusher, PLS vertical impact crusher, and YKR vibrating screen. 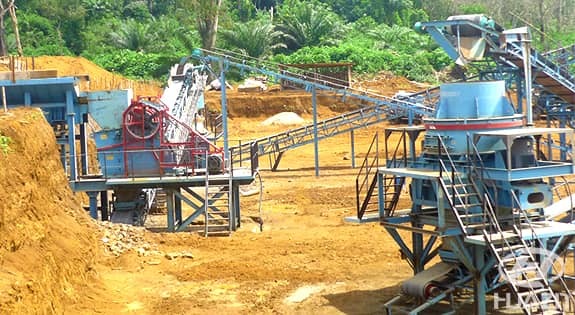 The production line is for granite crushing in Kenya, second purchase by the customer. 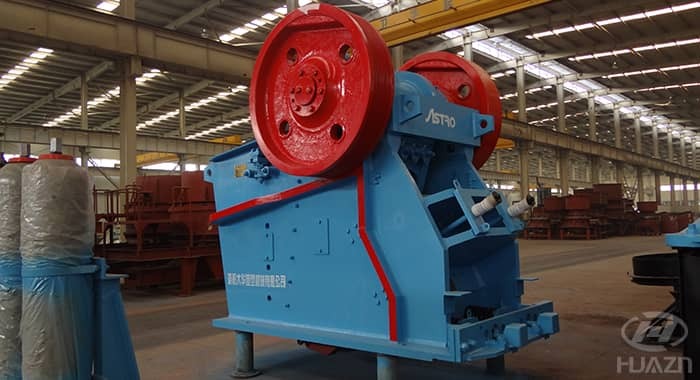 The main equipment: ZSW vibrating feeder, ASJ-E jaw crusher, PLS vertical impact crusher, and vibrating screen.